This Customer had an awkward corner shower that didn’t quite fill the floor space and left an unusable section of the bathroom that collected clutter. 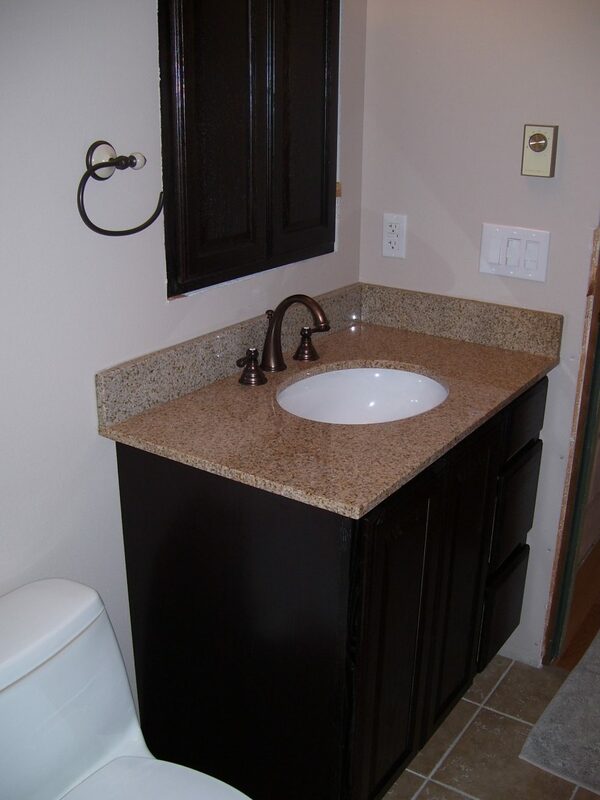 The finishes were very dated and the fixtures needed to be replaced. 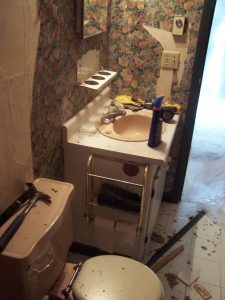 A complete bathroom renovation was in order. Although they were looking for a total bathroom remodel they were looking at premade shower units and felt very limited by those options. The bathroom was just a little (8”) larger than most stock shower units. They were also planning for the future and were looking of ease of entry and a seat but didn’t like the sterile look of the premade units. So we suggested a custom tile shower and went over design options such as a seat, niches, curb height and decorative details. 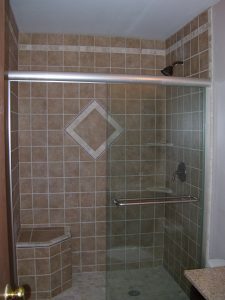 We designed a shower that was easy to get in and out of, had a seat and the option for grab bars if needed down the road. If you like the idea of a tile shower but wonder if it can be done in your bathroom renovation because of the age of the house look at some of the thing we had to do with this one…Leveling the floor, keep in mind this is before the pan was installed. 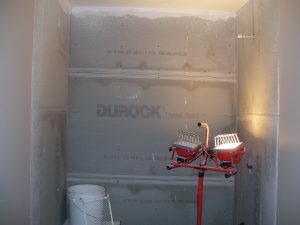 Squaring and plumbing the walls. Nothing shows crude framing like straight and true grout lines so we make it a habit to shim level and square the walls in all our remodels.